In the midst of a contract dispute, when dealing with the repercussions of professional negligence or when attempting to determine how to recoup financial losses caused by securities fraud, you need an attorney who will be able to take a close look at your legal matter and develop a plan that is designed specifically to protect your interests and carry out your goals. This is the level of legal representation provided at DominaLaw Group pc llo. Our business litigation department focuses on these complex matters with unmatched levels of determination and vigor. Since 1975, DominaLaw Group has approached the field of complex commercial litigation like no other firm. We do not provide "cookie-cutter" representation using forms first drafted years or decades ago. Our attorneys take each case on an entirely individual basis. Our approach involves taking a step back and looking at the big picture, taking the time to truly understand a client's goals and then working backward from that point to determine what strategy will yield the best result. 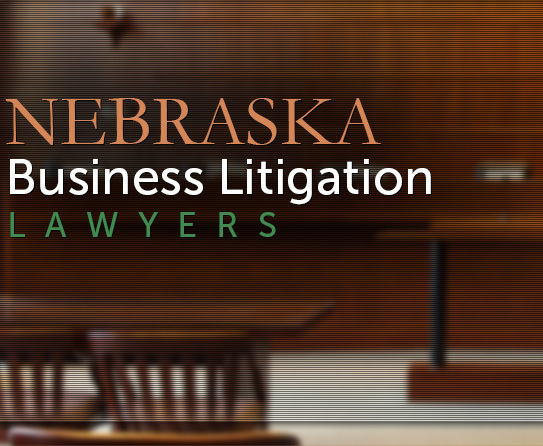 In working with a Nebraska business litigation lawyer from our firm, you will have our entire team and the force of our diverse experience and reputation in your corner. Founded by David A. Domina, our firm has built a reputation for excellence based on our high standard of ethics and professionalism along with our aggressive representation and individualized client service. Mr. Domina has led by example, first achieving the highest possible AV®-rating from Martindale-Hubbell® in just his fourth year in practice. He also won multi-million dollar jury verdicts before age 25, an accomplishment rarely met by young trial lawyers. He is also the only attorney to have secured a billion dollar trial verdict as well as capital murder acquittals. Add to this his diverse trial experience in State and Federal Courts in 43 states across the U.S., more than 330 trials to verdict and more than 260 appeals argued, and you have an attorney who has the type of background and proven track record you should look for in your legal representation. Mr. Domina and our other trial attorneys represent individuals, businesses and business owners in a wide range of sub-categories of business and commercial litigation. From our offices in Omaha, we represent clients across Nebraska. Litigation is the process of initiating and carrying out a lawsuit. Commercial law governs commerce-related transactions, both domestic and international, and business-related matters. Complex commercial litigation therefore deals with lawsuits filed against and on behalf of corporations, public organizations and businesses. Some of the sub-categories of commercial litigation include: contract disputes, insurance disputes, business structures and formation, professional negligence, construction defects, securities fraud and class action lawsuits. Every sub-category of commercial litigation has its own set of State and Federal laws and regulations to be considered as well as types of evidence and information that prove critical to building a client's case. Our business lawyers take it upon themselves to exercise due diligence in investigating each case and reviewing all applicable case law and legislation anew, no matter how many cases of the kind we have handled in the past. A fresh approach to every lawsuit is necessary to make the most of our counsel. Disputes between businesses, shareholders and partners can take a heavy toll on these individuals and can impact the company or companies involved as well. Consumers wronged by professional negligence and bad faith insurance practices may find themselves suffering from financial problems for the rest of their lives. Through our representation of interested parties, we strive to protect immediate and long-term financial interests while seeking justice and bringing peace of mind when it's needed most. There is nothing easy about commercial litigation. These cases may require hundreds or even thousands of hours spent investigating and preparing the case and evidence to present the client's story in a clear and compelling manner to the jury. Every step we take from the moment we take on a new case has the ultimate endgame in mind: the presentation of the client's case in front of a jury of 12 strangers. We must draw upon our experience in every type of case we have handled to determine what approach will most likely meet with success. 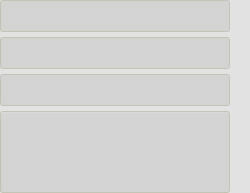 We must communicate with these people in such a way as to get through to them. We must present evidence and examine and cross-examine witnesses to show the jury that they should side with our client and award him or her the recovery we believe he or she needs and deserves. In the courtroom, we play the roles we were meant to play, putting on pressure and utilizing aggressive tactics when necessary and taking a finessed approach when this is more likely to make an impact. DominaLaw Group is not your average law firm. 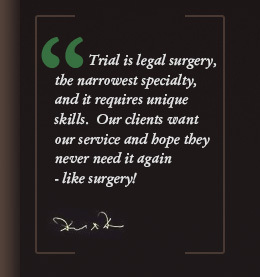 We are not your average trial lawyers. Every client receives a custom solution built to address the unique dispute or lawsuit he or she is dealing with. We do not sit around and talk about going to trial or talk about how we are trial lawyers. We put our money where our mouth is, so to speak, taking our clients' cases to trial instead of accepting quick settlement offers that might not actually be the result our client was looking for. We litigate to secure the best possible outcome for each client while making as big of an impact as possible on the at-fault party and the system. We thrive on going head to head with opponents with more funding and employees at their disposal, never backing down from a fight that may make a difference for our client. 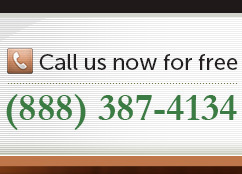 Contact a Nebraska business litigation lawyer at DominaLaw Group and find out what a difference we can make for you.